Western themed graduation gift wrapping paper. Personalized gift wrapping paper. I have come out with some new designs in the Rodeo Days Store. This time the designs are on graduation gift wrapping paper and have western, rodeo and horse themes. Some of the designs can be personalized with a name or other text to make it even more special. I know any rodeo cowboy or cowgirl will enjoy receiving a gift wrapped in paper like this. Below are three versions of the rodeo design graduation gift wrap. There is one with barrel racers and pole benders, one with bull riders and bronc riders and another with calf ropers, team ropers and steer wrestlers. Each has a belt buckle in the center that has "Class of" and 2019 printed on a graduation cap. I would also suggest that these wrapping papers could just be rolled out and used like a banner for a party decoration. Another western design has cowboy boots with a graduation cap and belt buckle "Class of 2019" and the background is turquoise leather print. Two others in the graduation collection are the Cowboy boots, hat, rope and belt buckle with 2019 on a gold background and the words Congrats Grad and the girl wearing a graduation cap riding a horse through a field and the words Follow Your Dreams. The designs below are created so that the name can be edited. This one with the rose colored cowboy boots, hat and flowers says Congrats to the Grad and below the hat is a sample name to personalize. I show an example of personalizing at the bottom of this page. These designs with cowboy boots, graduation cap and belt buckle are set up so that you can change the name or word on the belt buckle. When you arrive at the product page you will see a box on the right hand side. 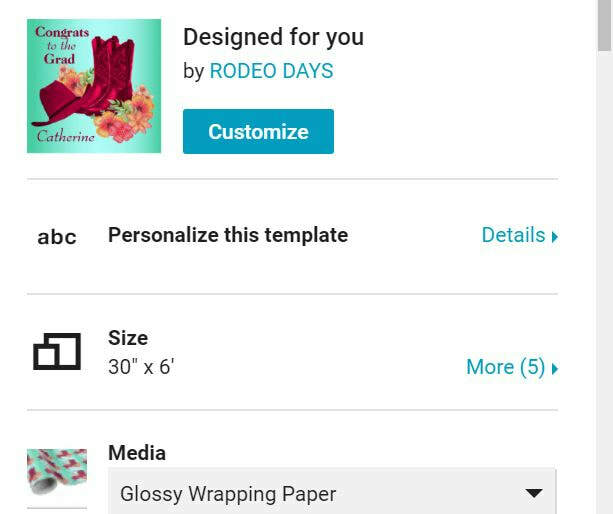 (shown in picture below on left) Where it says "abc Personalize this template", click the details button and it will open up a box like pictured here on the right. Back space over the sample name and type in what you want. Click the X in the corner and you will see the wrapping paper with your text in place of mine. I have lots of other western and rodeo themed gift wrap for all occasions as well. You can see the full collection here. The western and rodeo Christmas gift wrap is here.